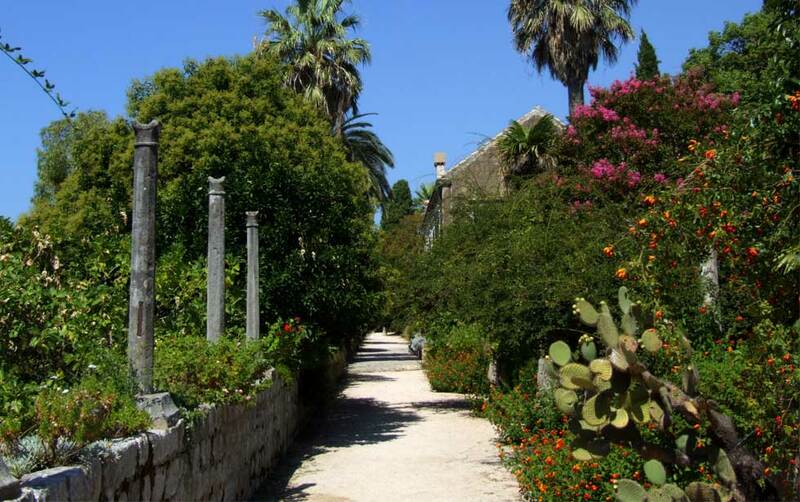 The arboretum Trsteno lies 18km Northwest to Dubrovnik. It developed out of a park surrounding the summer residence of the Gučetić-Gozze family. Family Gozze requested of ship captains to bring back all kind of seeds and plants from their travels. It is the oldest planned Renaissance park in Croatia (according to an inscription from 1502.) In 1948 it was declared a natural rarity and in 1962 registered as a protected natural monument that covers 255 000 square meters. The philosopher and a writer Nikola Vitov Gučetić (1549-1610) lived here for a time. The last owner, Vito Gučetić Bosiljević (Gozze Basegli) collected many old stone sculptures and fragments, some of which he had built into an artificially constructed ruin while others were disposed around the villa. Round the house are planted date-palms, Japanese banana trees, bougainvillea, evergreen magnolia, many varieties of cactus and other exotic plants. Particularly notable are two plane-trees (Platanus orientalis) at the small square in the center of the village, which are over 500 years old and are unique specimens of this kind of tree in continental Europe. Their trunks are over 5 m wide with a height of 50-60m. During the Homeland war, Arboretum Trsteno was extensively damaged by series of Serbian and Montenegro gunboat and air attacks, which set Arboretum to fire and 80% of the vegetation was lost (more than 10.000 old and younger trees and 30 species of exotic trees). Devastation of Arboretum was so severe that it would take another 80 years to restore Arboretum to a pre-war state. During the occupation of Arboretum, summer residence and it's surroundings was partially damaged and completely looted. The war wasn't the only damage that happened to Arboretum - in 2000. a forest fire during the drought damaged 120.000 square meters of Arboretum's vegetation. After all the devastation, Arboretum is mostly restored, part of Croatian Academy of science and arts (HAZU) and open for visitors. Arboretum Trsteno is also known as a major filming location of the 3rd and 4th season of Game of Thrones. Walk along the garden paths where Olena Tyrell and Varys plotted against Peter Baelish or sit in the lookout next to Olena and Margaery Tyrell to hear Sansa Stark's story.